Comedy generally does not work well in the Peplum genre. 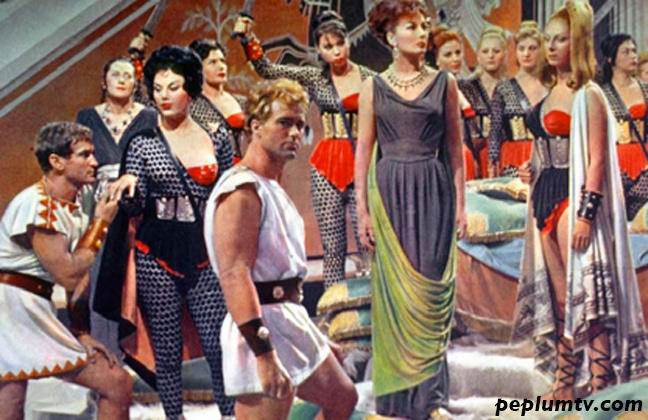 However, COLOSSUS AND THE AMAZON QUEEN shows that a first rate comedy is indeed possible in an Ancient World setting. TWO NIGHTS WITH CLEOPATRA and NERO'S WEEKEND are adequate - but not great - Peplum comedies. MY SON, THE HERO is an example of a really poor Peplum comedy. The humorous sidekick is generally a mistake in mainstream Peplums, but it very seldom spoils entire films. When comedy is unsuccessful in Peplums it's mainly down to grating, badly written "comedy" characters, in my opinion. The comedy in "Colossus" works fine, and the cast is great. By the way, did these amazon costumes pop up in another movie, or am I just imagening that?